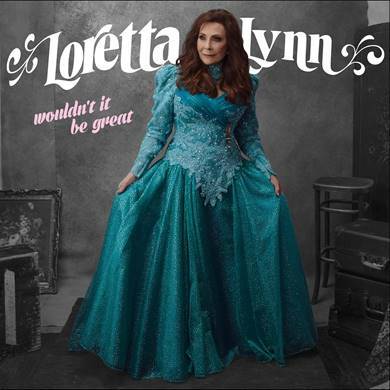 Legacy Recordings (a division of Sony Music Entertainment) will release Wouldn’t It Be Great, the new studio album from American music icon Loretta Lynn, on Friday 18th August. One of the most deeply personal albums of her career, Wouldn’t It Be Great is comprised entirely of songs written (or co-written) by Loretta, premiering new compositions nestled alongside select soulful reinterpretations of enduring classics from her catalog. Wouldn’t It Be Great is available for pre-order now on Amazon and iTunes. Like its predecessor, the critically-acclaimed, Grammy-nominated Full Circle (released March 2016), Wouldn’t It Be Great was mainly recorded at the Cash Cabin Studio in Hendersonville, Tennessee, with producers Patsy Lynn Russell and John Carter Cash. An exploration of Loretta’s songwriting, Wouldn’t It Be Great finds her communicating the universality of human experience – love in all its intoxication and heartbreak, the things of the soul and spirit that abide, the transformative power of making music and connecting. Wouldn’t It Be Great debuts new songs – “Ruby’s Stool,” “Ain’t No Time To Go,” “I’m Dying For Someone To Live For” – alongside newly recorded renditions of recent compositions (“God Makes No Mistakes,” from Lynn’s 2004 Grammy-winning Jack White-produced Van Lear Rose) and immortal classics like “Coal Miner’s Daughter” (the song Loretta says she’s most proud to have written, also the title of her 1976 memoir and subsequent Oscar-winning 1982 film adaptation) and “Don’t Come Home A’ Drinkin’ (With Lovin’ On Your Mind),” her first of 16 career No. 1 country singles. A self-taught singer, songwriter and performer, Loretta Lynn is an archetype of American music, a singular artist whose music defined a genre and whose songs continue to inform new generations of musicians. Loretta made waves in the world of American music once again with 2016’s Full Circle, her first album in more than a decade. A powerful return-to-form, acclaimed by fans and critics alike, the album debuted at No. 4 on Billboard’s country charts (Loretta’s 40th Top 10 country album and her highest-charting album ever on the Billboard 200) and was nominated for Best Country Album at the 59th Annual Grammy Awards. Loretta followed Full Circle that same year with White Christmas Blue, an album sending listeners on seasonal trip to Lynn’s hometown of Butcher Hollow, Kentucky during Christmastime. 2017 is shaping up as a banner year in the life and career of Loretta Lynn, an American music legend who turns 85 on April 14th. The fabled Ryman Auditorium in Nashville has slated two celebratory birthday shows on April 14th and April 15th, which are both sold out. Loretta will revisit the Ryman Auditorium again on August 25th and 26th. As part of its 50th anniversary commemoration, the Country Music Hall of Fame and Museum is mounting a major exhibition – opening August 25th, 2017 – focused on the life, art and music of Loretta Lynn. “I am so happy the Country Music Hall of Fame has asked me to be one of their main exhibits in 2017…gonna show off my 50 some odd years in country music!,” said Loretta. “They best have a big space…I have a lot of stuff! I’m so proud to share my life, and music with the Hall of Fame. Y’all come see us!” The exhibit is scheduled to run through to June 2018.